There is a stone. A deep, obsidian black, it is wrapped in white cloth, held in a square of light, until a man comes to unwrap it. It is not something he's found, but something he has been drawn back to, a token of his past that he swallows and carries like the memory of a sin. When he climbs the pole set centre-stage and tosses the stone in the air, his body drops in time with it; whatever it is, it is equal to him. Contigo is a bold piece. For one, it has to be among the physically most challenging solo shows I've seen: a solid 50 minutes of movement, much of it acrobatic, with brief rest afforded only when João Paulo dos Santos hikes a metal chair to the top of his Chinese pole and affixes it on hooks—and then the whole thing wrapped in a narrative character itself seemingly inspired by the imprisoning repetition of an exhausting dream. But there's something gutsy too about the choices that Contigo makes in presenting itself: it's a piece that makes you understand it by the intensity of its own conviction, and at its most lucid João's willingness to undertake risk, to climb, feels both driven and held back by the stone and its weight. There are stretches which exert less theatrical force. João is more parts acrobat than dancer, and where he is confident whipping his body around the pole, his footwork in the opening scene is a little unsure—but the distraction disappears as the piece progresses and moves from agitation into the meditative introspection of a calm dark voyage. 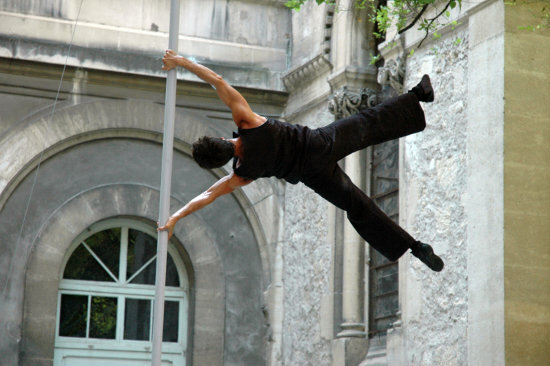 João is of course a very good pole artist, but that's not the focus here, and actually the most nerve-wracking moments are seeing him climb over the top of the pole to stand in the fixed chair—nearly touching the ceiling of the high, high Linbury Studio—then to grasp the arms and lower his whole body, face-first, over the edge. Though the truth of it all is felt more sharply in some scenes than others, it's a pleasure to see work of this ambition and accomplishment: bizarre, ritualistic; not something you can easily explain, and not something you'll soon forget. For more on João Paulo dos Santos see his interview and profile in the book Panorama contemporain des arts du cirque. He's also one of the artists featured on the double-DVD compilation Le Nuancier du Cirque.